El Morro Principal Chris Duddy, Thurston Principal Jenny Salberg, Student Resource Officer Cpl. 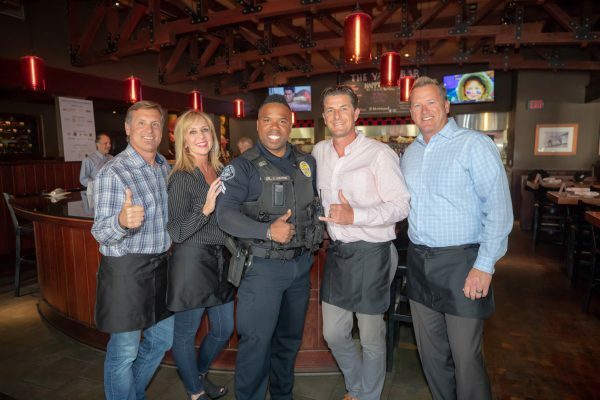 Cornelius Ashton, Laguna Beach High School Principal Jason Allemann, and Top of the World Principal Michael Conlon at the 10th annual Lumberyard Chef Challenge benefiting SchoolPower. Photo by Kristin Karkoska/Blue Sky’s Studio. 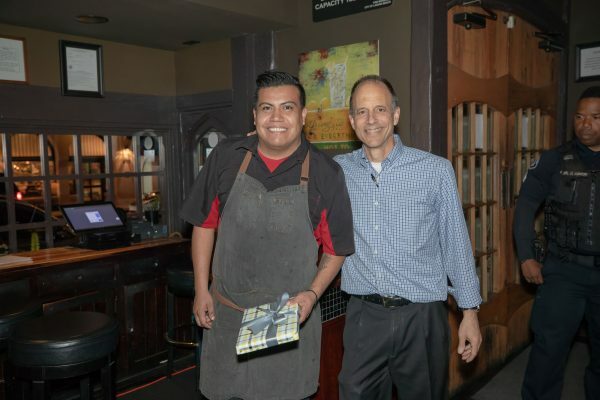 On April 1 at the Lumberyard restaurant, Laguna school principals dueled as guest “chefs,” serving up competing three-course meals to a sellout crowd of SchoolPower supporters. 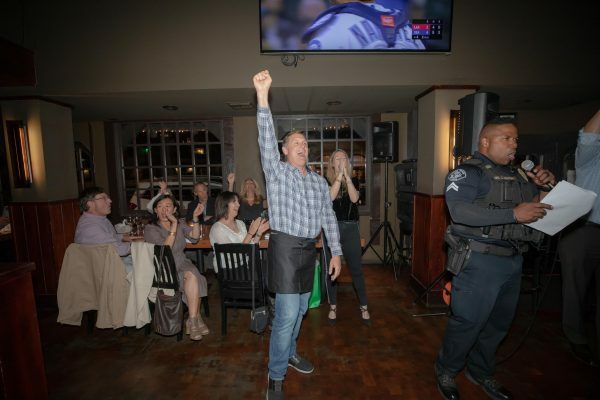 It wasn’t an April Fool’s joke—it was the 10th year of the Lumberyard Chef Challenge, a beloved event that this year raised over $10,000 for SchoolPower. The event was conceived by Lumberyard owners Cary and Suzanne Redfearn. The Redfearns donate their restaurant, including all of the food and staff, for the event. 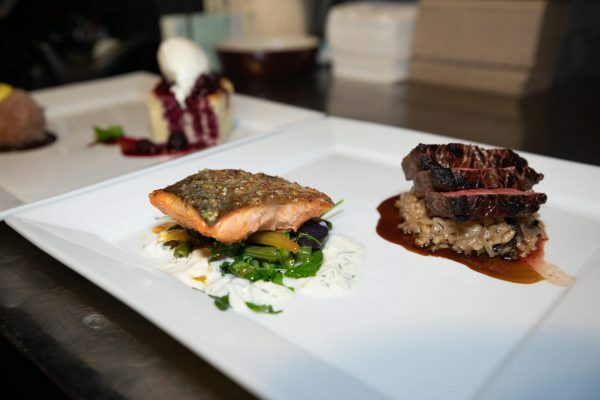 The principals select items and serve guests, but the dishes are conceived and prepared by Chef Josue Tavare and the Lumberyard staff. 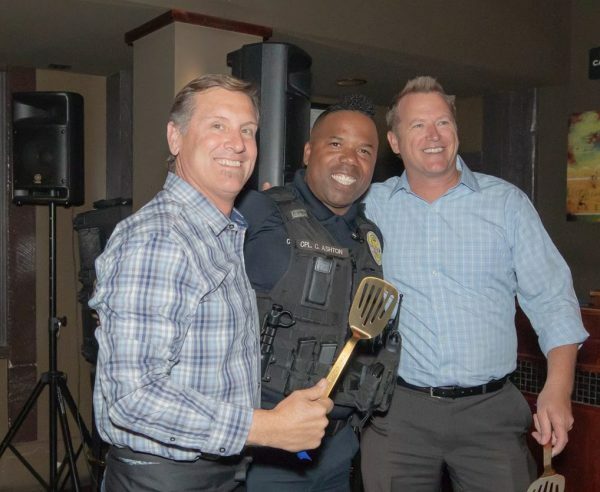 This year the elementary school principal duo of Chris Duddy and Michael Conlon took home the coveted “Golden Spatula.” Their entree, grilled Angus New York steak on a bed of mushroom risotto, beat out Laguna High School Principal Jason Allemann and Thurston Middle School Principal Jenny Salberg’s pan roasted Tasmanian Red Trout with spring vegetables. New to the event was School Resource Officer Cpl. Cornelius Ashton, who helped tally votes and announce the winners. SchoolPower trustee Monica Golden was excited to meet him at the event. “I had heard great things about Officer Ashton from my kids, so it was great to chat with him at the Lumberyard. He has a way of instantly engaging you and is such a positive person. I can tell why everyone loves ‘Officer Corn,’” she said. Guests also sampled signature cocktail concoctions made by SchoolPower Endowment Board President Chris Clark and SchoolPower’s First Lady Katie Houlahan. Clark won the honor of top bartender for a third year running. “Each year the event seems to get better—the food, the energy, the people—and we look forward to the tradition continuing for many years to come,” Suzanne said.